When I was in my early 20s, I made the first major purchase of my adult life: a mattress. Prior to arriving on the showroom floor staring down the responsibility of adulting for real this time, it had not occurred to me that every place I’d ever slept was furnished by someone else. Now, face to face with a seasoned sales pro, I had to admit that I’d taken a lot for granted. How had I gone this long without knowing anything about the surface where I spent a third of my day? My salesperson talked a big game about comfort pocket coils and luxury pillow tops, but I was quickly drifting off toward the price tags without commas. He called out to me then — not following because I wasn’t worth the lost commission — to make one last ditch effort to overcome sticker shock objection. “It’s really just pennies a day,” he insisted. I bought a mattress (in the mid-3-figures-thank-you-very-much) using the same methodology I learned to buy everything from rain boots to shredded wheat — using as little money as possible with an emphasis on utility. But I had to admit he had a point. The daily cost difference between the basic and luxury models over the course of 10 years was, in fact, just pennies a day. It’s the same tactic used to sell other big ticket, long term items like cars and roofing shingles. The luxury option that lasts a solid, comfortable couple of decades is better than a cheap-o model that you have to replace every 3 years, right? Besides, sales pros insist, if you’re going to spend that much time using something, don’t you deserve something that you enjoy? I’m certainly not the only person who has ever made major and minor purchasing decisions with the goal of pushing that bottom line down as far as it can go. I grew up in a working class culture that values frugality and pragmatism while demonizing selfish excess. So, for myself and many others, self-worth gets all kinds of mixed up in the choices we make about which things to buy when, for whom, and how often. Treating Mom to a luxury spa day for her birthday — no expense spared. New throw pillows for you — mismatched set from the Bed Bath & Beyond clearance section, arguing with the cashier over a coupon even though you know they won’t honor it but it’s the principle of the thing. In my last article, I wrote about how I started to think differently about my eyewear as self-care. It was a process that took quite a few months of walking into (and right back out!) Specs Around Town, my local, independent optical boutique while I processed what it meant for me to be the kind of person who deserved fun experiences and special things in my life. 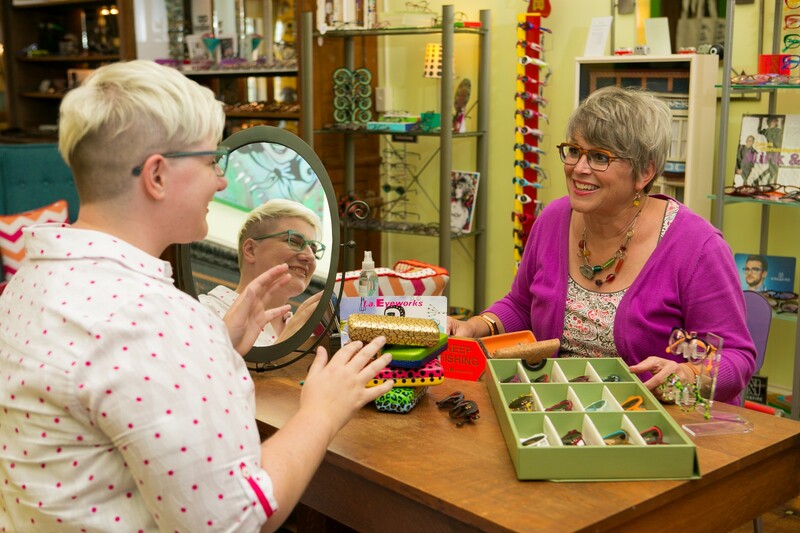 Julie Kubsch, Specs Around Town owner and head optical wizard, is deeply passionate about what she does. For 20 years, Julie has been providing personalized optical experiences to her clients in central Illinois and beyond. She tunes in to personal style, gives frank opinions on what works and what doesn’t, and assesses fit in ways both scientific and aesthetic. Prior to working with Julie, my method of choosing frames involved staring at a wall of mostly grey and brown rectangles, squinting to try to see what I looked like, and occasionally soliciting the opinion of my optometrist’s assistant. It’s a perfectly serviceable way to choose eyeglasses, but, oh, the joy when you don’t have to second-guess your amateur opinion! I trust Julie when she says those frames look great on me because she knows what she’s talking about. It frees me up to spend my energy fawning over which bespoke, handcrafted frames best convey whimsical approachability without compromising the cool, effortless authority of an emerging thought leader. The way I care for my glasses is completely different now than when I chose off the rack from a mega retailer. Yes, I’m more conscious of how I care for my lenses and frames because I upped my financial investment, but that’s a small part of the story. I am proud of my eyewear so I want to protect them. I used to clean my glasses when I couldn’t see the TV anymore or when someone else noticed the green crud that collected around the nosepads. Now, I use the case to store my glasses at night, and clean them properly every morning before I put them on again. I love this change in my routine because it’s not just about respecting my glasses, but respecting myself. I show up in the world differently — more confident, more willing to connect, and more like a leader — when my outside look matches how I want to feel. For a long time, I never quite understood women who said that putting on their perfume or their jewelry completed their look as the final step of their process of getting ready for the day. I’ve even heard accessories described as armor. I get it now. When I put on my glasses, I feel like Superman stepping out of the phone booth* — ready to take on the world. I started daydreaming about a collection of frames for every occasion because I finally knew what it felt like to choose a style based on a mood — that option isn’t available when you only have one pair of glasses. As you start to learn more about the history, philosophy and experience of working with each brand, you’ll gravitate toward favorites. 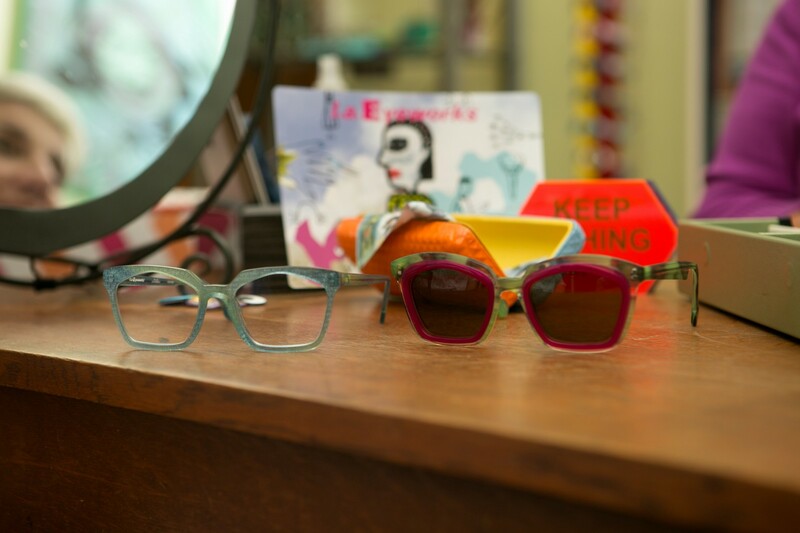 I love the quirky, colorful, distinctive l.a.Eyeworks brand and resonate with so much of their philosophy and approach to design. And when you find your favorite brand, it’ll feel like coming home. Julie shared an interesting perspective when it comes to making the leap to designer eyewear — even though eyeglasses are the first thing people see on your face, many people take a one-style-fits-all approach. “People happily invest hundreds or thousands of dollars in shoes and jewelry and handbags to create different looks but can’t imagine owning more than one pair of glasses,” she says. I had to admit that I never thought of my glasses as more than something I need to see, and I certainly didn’t believe that I needed more than one pair every few years when my prescription changed. But now I’m thinking about incorporating my eyewear into my personal budget as part of my wardrobe, investing in quality pieces. The main change I noticed in myself after wearing my l.a.Eyeworks frames for a few months is that I started to appreciate my eyewear as part of my identity. There’s a larger implication for cultural norms about glasses that I’d like to write about more in the future, but it goes back to the idea that when people wear or use assistive devices, these items are add-ons, extras, or not actually part of the person. Eyeglasses carry much less of a stigma than wheelchairs, hearing aids, prosthetics, dentures, or mobility aids like canes or scooters, but historically, eyeglasses have been understood as compensating for deficiency. Even though I’ve been wearing eyeglasses child early childhood, I never considered that I also choose to wear glasses. When I was a teenager, I tried contact lenses but quickly realized that I didn’t feel like myself without my glasses. I felt unrecognizable and that my entire face changed. But it wasn’t until I married the fact that I am a glasses-wearer with the idea that I could use my frames to make a statement to the world about who I am that I truly embraced my glasses as a part of my identity. I’m proud to be a glasses-wearer and I love that others can see me for the whole of who I really am. An eyewear purchase doesn’t have the broad applicability of a mattress, but if you’re a glasses-wearer who is ready to explore the world of independent eyewear collections and opticians, one thing stays the same — online shopping isn’t going to work. There’s no single search to find locations, so I recommend doing a brand-first search. Use Pinterest or Instagram to search #independenteyewear to find a brand you like, then use their retail locator to find shops near you. Ask for the optician’s advice on styles and be open to discovering new brands. I understand all the reasons people might have for choosing to wear contacts or choosing to accentuate their style with other accessories. But I hope that these articles have helped you reframe (no pun intended) the conversation around who deserves to be seen and introduced my glasses-wearing readers to the possibility of a different kind of relationship with eyewear. Frames that makes you feel good and the individual attention of a professional who understands you isn’t a luxury reserved for the rich and famous. You deserve to be seen and your confidence is worth so much more than pennies a day. *Look. When I wrote the first draft of this article, I was looking for a relatable analogy for well-known transformation. I realized much, MUCH later that Clark Kent takes off his glasses when he becomes Superman. Yeah, I felt really deflated (and, frankly, dumb) when I realized what I’d done — undermined my own argument for eyewear as signature power statement by referencing yet another character whose power comes after ditching the glasses. But if you’ve followed this asterisk all the way down here, I hope you’re the kind of person who appreciates a good moment of vulnerable introspection. Start a tally of all the strong, powerful, desirable & bespectacled characters you find…I’ll wait.